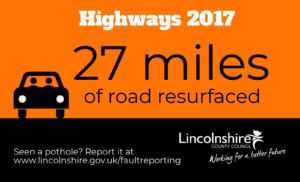 2017 was a busy year for Lincolnshire’s highways team. Over the course of the year we carried out around 34,000 jobs, including about 4,000 emergency repairs, around 97% of which were done within 24 hours. 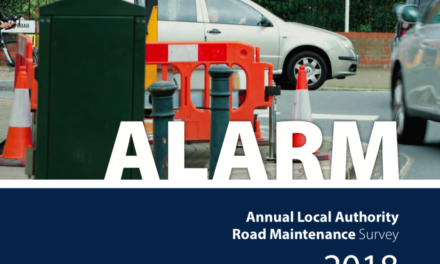 Our maintenance work included a £5m year-long pothole patching programme, which eliminated some of the worst potholes across Lincolnshire and prepared some roads for future surface dressing. 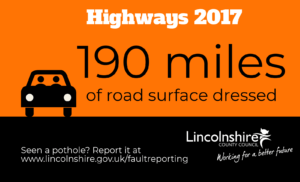 Overall, our team repaired around 90,000 potholes, resurfaced 27 miles of road and surface dressed 190 miles of carriageway across the county, helping to keep Lincolnshire moving. And, of course, our team of 43 gritters were out battling the bad weather day and night, recently covering a distance equivalent to a round trip to the South Pole in just four days. Aside from day-to-day maintenance, we also made some significant improvements to the local highways network. In early 2017, we made a series of improvements to increase traffic flow at Sutterton roundabout, a key pinch point on the A16. 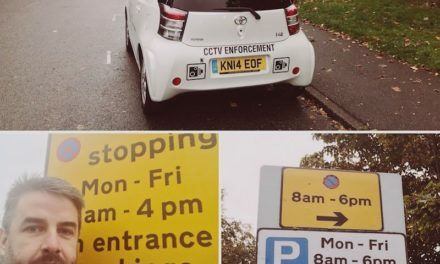 This was followed by the £5.4m Peppermint Junction improvements. 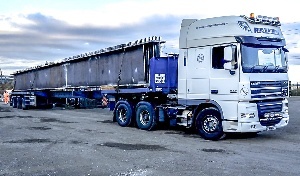 This saw the creation of a new three-arm roundabout at the A17/A151 junction in Holbeach, making access to the A17 safer, easier and faster. The project also involved the construction of a second roundabout providing access for the proposed South Lincolnshire Food Enterprise Zone and Holbeach West housing development. During the summer, we carried out extensive surfacing and drainage improvements at North Hykeham’s busy Newark Road/Station Road /Moor Lane crossroads. We also began the £800,000 refurbishment of a section of Lincoln High Street. The improvements are expected to be completed in early 2018, and will create a more open and pleasant space for shoppers, helping attract greater footfall for local businesses. More recently, we started £2.4m of repairs to the embankment of the A17 Sleaford Bypass, with large-scale drainage improvements and measures introduced to prevent further slippage and deterioration. Works are expected to be completed by the end of April. Of course, to tackle congestion effectively it’s important that we make alternative forms of transport as attractive as possible, encouraging people to leave the car at home. Over the course of 2017 we continued work on the £5.7m Go Skegness project, bringing the area improved bus lanes, bus stops and pedestrian crossings, along with new cycle routes and footways. Meanwhile, in the west of the county, the Access Lincoln project continued to go from strength-to-strength. Over the summer the team launched an extension of its popular hirebike service – including its first electric bikes. And in the autumn, our award-winning CallConnect service began servicing more than 60 new stops in West Lindsey, thanks to support from the district council. While these were perhaps our most visible projects, a lot has also been happening behind the scenes. There has been a lot of preparatory work for the £99m Lincoln Eastern Bypass and the second phase of the £81m Grantham Southern Relief Road. People can look forward to seeing significant progress on both these major new routes in 2018. Meanwhile, in October, the council was awarded £2m by the Department for Transport for the construction of a new three-armed roundabout at the A46 / Lincoln Road junction near Dunholme and Welton, which has a history of accidents. The work should be completed in 2020. And we unveiled the Boston Transport Strategy 2016 -2036, which set out our vision for the future. The plan includes major new roads, better public transport and improved facilities for cyclists and pedestrians, aiming to ease existing transport issues while supporting the future development of the town. 2018 promises to be equally busy. We will again be repairing tens of thousands of potholes across the county, and have some exciting projects lined up, such as the £2m congestion-busting improvements planned for Lincoln’s busy Wragby Road junctions, which are due to start in February. 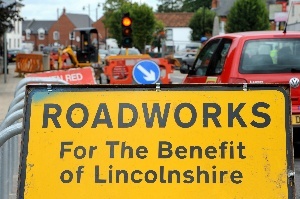 You can keep up-to-date with all the latest roadworks news by visiting www.lincolnshire.gov.uk/roadworks. Lincoln Eastern Bypass Archaeology goes on tour!